In Austin, we recently worked to pass a law mandating that all employers provide their workers with earned paid sick days at a rate of 1 hour earned for every 30 hours worked. In some places in the country, this might not sound very impressive, but deep in the heart of Texas this counts as a significant leap forward for workers’ rights. In fact, we’re the first city in the south to guarantee workers paid time off when they’re sick. For Austin DSA, this was a really energizing win. But it’s not just the content of the reform that’s been so energizing. Winning any reforms in a state like Texas, even in a city as ostensibly “progressive” as Austin, takes an enormous amount of organization and mobilization. In addition to a deeply reactionary state legislature, Texas’s version of the Democratic Party is even more corporate and business-friendly than the national Democratic Party, with many members of our city council openly connected to the local Chamber of Commerce and independent business association. Any kind of improvements in the conditions of working people in Austin, whether reformist or non-reformist, requires a high level of activity on the part of Austin workers. 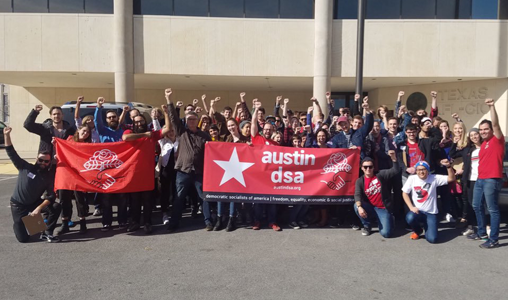 The Paid Sick Days campaign, by providing a tangible and within-reach goal for Austin workers, brought large numbers of Austin workers into collective action for the first time. This was true both within DSA and without. For DSA in particular, the campaign was deeply beneficial. Like many chapters, Austin DSA has far more paper members than active members, and absent a “Bernie Sanders for President” campaign for people to work on, moving large-numbers of DSA members into collective action can be a challenge. But by calling all of our members and talking to them about our campaign, we were able to move previously-unattainable numbers of Austin DSA members into action. Our activity in this campaign also helped forge much closer connections with other worker organizations in town, and many members and leaders of labor groups in town joined DSA and adopted explicitly anti-capitalist framing for their activities over the course of the campaign. In fact, Greg Casar, the city councilmember who originally proposed the local Paid Sick Days ordinance, joined DSA during the campaign. On the day the ordinance came to a vote at city council, council member Casar placed a rose on the dias in front of him and DSA members led a diverse coalition of workers in singing “Solidarity Forever” as the ordinance passed. It feels like things are starting to change in Austin. I’m relating the experience of our Paid Sick Days campaign not because I think Paid Sick Days is a revolutionary reform. In fact I think it’s pretty clear that a few hundred thousand workers in Texas getting to take the day off from work when they’re sick is unlikely to lead to the revolutionary overthrow of capitalism, or the destruction of global imperialism, or the negation of the value-form. Capitalism in Texas is alive and well in 2018, and overall the effect of workers taking the day off when they’re sick might just be to strengthen capitalism by virtue of improving the overall health and well-being of Texas workers, making them more ripe for exploitation at the hands of Austin capitalists. So what, then, do we mean when we talk about revolutionary reforms? The term is usually attributed to André Gorz, who defined non-reformist reforms as those reforms which “advance toward a radical transformation of society” and “modify the relations of power.” DSA comrade Meagan Day put it well when she said that non-reformist reforms are those reforms that “actually shift the balance of power in a dramatic way, even if they don’t by themselves demolish all of capitalism.” I’d add that they’re those reforms that take some part of commodified life under capitalism and removes that part of life from the distortions of profit-seeking industry, instead provisioning those goods or services under democratic control and for the social good. Reformist reforms, on the other hand, may seek to improve the lives of people under capitalism, but they do so without fundamentally challenging capitalism. At any point in which a reform could be potentially destabilizing to capitalism, a reformist orientation will privilege the maintenance of existing power relations over improvement in people’s lives. Non reformist reforms, on the other hand, are those reforms that explicitly and deliberately serve to destabilize capitalism. They’re reforms which weaken the power of capital over labor and move us closer to the end of capitalism. For a reform to be a revolutionary reform it’s got to do three things all at once: it’s got to improve the lives of workers, it’s got to weaken capital by decommodifying a crucial sector of capitalist accumulation, and it’s got to move working class people into collective action on our own behalf, shifting the balance of power between capital and labor. And with Medicare for All, we have a unique opportunity that fits all three criteria nicely. But it’s not just the content of a reform that makes it fall within the category of “reformist” or “revolutionary,” right? It’s easy to imagine a President Tim Kaine signing some watered-down version of Medicare For All into law in the summer of 2021 in a way that’s totally non-threatening to the for-profit health industry, maybe even with some degree of bipartisan support. Obviously, that’d be a reformist reform, and not something DSA should be inclined to get behind. But, even though it’s a little harder to visualize, we can imagine President Bernie Sanders passing a much more robust version of Medicare For All into law in 2021. But even if a Sanders version of Medicare for All ticks all five boxes in the DSA Medicare for All plan, there are still ways in which such a bill could pass that wouldn’t qualify as a revolutionary reform. A version of the bill in which a thin tier of elite power brokers reached a deal without the mass involvement of the working class would still bear the tell-tale signs of reformism, even if some of the power brokers who passed the law called themselves socialists. This is because the crucial factor in non-reformist reforms isn’t the “what” of the reforms. It’s the “who” and the “how.” Gorz put this well when he wrote, “a reform cannot be separated from the action which produces it.” This is crucial when thinking about what constitutes a revolutionary reform; it’s a matter of process. Gorz expands on this elsewhere when he says: “The liberating value of reforms can only manifest itself if it is already present in the mass actions aiming to establish them.” The difference between reformist reforms and revolutionary reforms is the difference between “bureaucratically applied institutional reform and a reform imposed in the heat of collective action.” It’s this “heat of collective action” where the real power of a non-reformist reform lies; the ability of a reform to set workers into action, and the ability of organizers like those in DSA to mobilize working class people in the pursuit of a reform. The significance, here, and the reason it was worthwhile for Austin DSA to get involved in the Paid Sick Days campaign in the first place, is that the campaign put workers into collective action as a class for themselves. And Medicare for All, in addition to being a significant reform, has the potential to put incredible numbers of working people into collective action. And that’s crucial, because for a reform to be a revolutionary reform it’s got to do three things all at once: it’s got to improve the lives of workers, it’s got to weaken capital by decommodifying a crucial sector of capitalist accumulation, and it’s got to move working class people into collective action on our own behalf, shifting the balance of power between capital and labor. And with Medicare for All, we have a unique opportunity that fits all three criteria nicely. I don’t think I need to explain how Medicare for All will improve the lives of workers, but in terms of weakening the power of capital, I think it’s worth considering the ways in which the healthcare industry in the United States has ballooned and metastasized. As you might know, healthcare costs account for nearly 18% of total US GDP; that’s on pace to break 20% in the next few years. Healthcare is second only to finance in terms of its importance to capital in the US, and it’s increasingly intertwined with the finance sector. In my view, Medicare for All is a revolutionary reform in 2018, but that wouldn’t necessarily have been true in every era of US history. For example, if we were living in the early 60’s, when healthcare expenditures hadn’t yet broken 5% of GDP, decommodifying healthcare wouldn’t have the same potential impact on the capitalist sector as it could have now. This might seem like a pretty marginal point, but I think it’s an important factor when considering the difference between Medicare for All in the context of the contemporary United States and the emergence of single-payer healthcare in European social democracy, which was passed at a point before the healthcare industry could become foundational to European capitalism. When we campaign for Medicare for All (or Paid Sick Leave), our goal can’t just be the mere passage of the reforms we’re pushing for. This is a different time and things are different here. Last year, the US spent over 3 trillion dollars on healthcare. Even taking into consideration that Medicare for All wouldn’t represent total decommodification, it’s likely that, were the Sanders bill to pass, it’d represent the single largest removal of commodities from the market in terms of raw dollars in world history. This could be as considerable as the mass decommodifications of the Soviet Union or communist China, given the smaller size of economies of those nations at the time of their revolutions. But it’s more than just the sheer size of the dent that Medicare for All would make in US capitalist accumulation that makes it a revolutionary reform. A socialist campaign for Medicare for All has the potential to empower the US working class to a degree which no other reform could. There are a few reasons for this. The most obvious is the degree to which the passage of Medicare for All could contribute to renewed labor militancy. If you’re a part of the majority of insured Americans who gets their insurance through your job you probably understand this intuitively. If workers decide to pursue any kind of job action, especially in an at-will employment state, they’re not just risking their job, they’re risking their access to healthcare. This puts a huge damper on workplace militancy, especially for workers with disabilities, chronic illness, pregnant workers, or workers with children and other dependents. By cleaving the connection between work and healthcare, the balance of power at every workplace in the country would shift dramatically in the direction of workers. This doesn’t mean we’ll win socialism overnight, but it does mean an increased ability for workers to organize as workers. Less easy to quantify, but maybe more important, is the degree to which people in the US are willing to act around health justice issues. You only need to look at the recent strike in West Virginia to see how central healthcare has become to politics in the US and the potential for healthcare to set working class people into collective political action. There, 20,000 teachers went on an illegal nine-day strike, largely because of the uncertainty around their healthcare. Ever since the Obamacare debate, healthcare politics have rarely been outside out the news cycle, and failing health is obviously something that everyone in the country has some degree of experience with. DSA has put together a very clear plan for Medicare for All, and simple messages like “no one should die because they can’t afford the price of insulin” are profoundly powerful and easy to get behind. We can articulate our vision for healthcare clearly and directly, and, in doing so, invite huge numbers of people into our movement as we work together to build socialism. This gets back to Gorz and his assertion that “a reform cannot be separated from the action which produces it.” When we campaign for Medicare for All (or Paid Sick Leave), our goal can’t just be the mere passage of the reforms we’re pushing for. When we’re canvassing, and we knock on someone’s door and ask them to sign a petition we’ve also got to ask them to get involved with our campaign. And then we’ve got to give them opportunities to be involved and make sure people feel welcome to participate. We’ve got to expand our base and develop new leaders and build DSA as an organization. Because, if we win Medicare for All but don’t manage to build up the socialist movement, then Medicare for All will wind up being a purely reformist reform, subject to roll-back and impossible to build on. There’s a passage from Nicos Poulantzas on the subject of reforms that I really like and find myself returning to frequently. Poulantzas said that, “to shift the relationship of forces within the State does not mean to win successive reforms in an unbroken chain, to conquer the state machinery piece by piece, or simply to occupy the positions of government. It denotes nothing other than a stage of real breaks, the climax of which is reached when the relationship of forces on the strategic terrain of the State swings over to the side of the popular masses.” Medicare for All is the most profound break, and the break that’s most profoundly realizable, that is available to US socialists in the current context. It’s probably the most profound break that’s been available to US socialists since the 60’s. In some places, this is going to mean canvassing for Medicare for All. In other contexts, like Texas, it might mean pairing Medicare for All with a local reform, or a mutual aid project around health justice. But we can’t lose site of the goal; this is too big of an opening for socialists to pass up. I’ve seen in Austin how campaigns around healthcare can build the capacity of a chapter and move working class people into collective political action. To fail to seize this moment would be a real tragedy for our movement. It’s easy to imagine our organization spending the next years arguing the finer points of socialist theory with each other online, and yet another generation of US socialists consigned to wander in the wilderness. I really want to urge everyone to embrace Medicare for All as a revolutionary reform that can turn up the heat of collective action. I’m really excited by this current moment, and I am looking forward to spending the next few years building worker power and moving towards a future where we can swing the relationship of forces over to the side of the popular masses. James Cole works in public television. He serves on the newly formed Democratic Socialists for Medicare for All Political Subcommittee and is secretary of Austin DSA.